I worked most the day lower down the trail, well below the falls. The river has boulders and fallen trees making miniature waterfalls all along it. 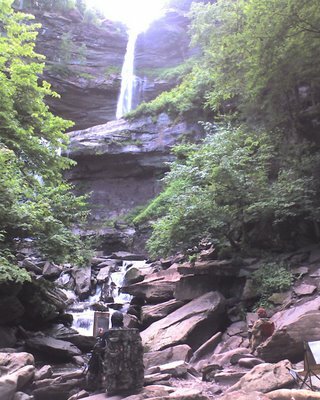 I definitely want to go back to the falls another day and work there again. But next time I'm taking my own transportation! These are wonderful sketches. Is the idea to take information from all of them to make a final painting? Sadei, beautiful sketches. 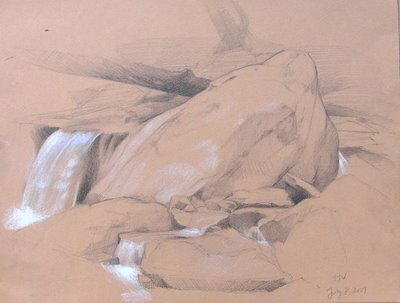 Is it the graphite mixing with the white charcoal that makes the rushing water appear blue in some areas? 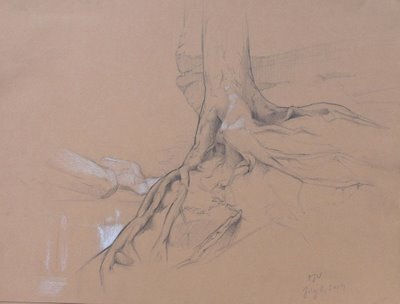 There is such a peacefulness in those sketches... no camera could catch the atmosphere that the human eye does and a talented hand translates. r.
I like the Hudson River painters. However if it was me, I would be out there painting. Just a thought. I know there is this methodology based on the Hudson River School, but I think they did what they did because painting in the field was very very hard in the 1830's. They did not have mosquito replant (Durand mentions this in one his letters on a trip, that the bugs were horrible) or paint tubes portable painting gear was not so good. They had to use horses to get around. So they made a lot of drawings and did the paintings back in the studio. Like the sketches by the way. I can't wait to see your oil sketches.